Buying habits are changing, with customers preferring personalized engagement over mass promotions. The challenge lies in creating relevant, useful, and current content to keep your audience happy. Marketing automation goes long way in helping you achieve this—nurture and engage your leads and customers with highly personalized content, and win more happy hearts. With Marketing Automation, you can add your audience into the right email series and reach out to them with relevant information. Trigger automated email series with Autoresponders. You don’t have to manually send a welcome email every time somebody signs up for your newsletter. Schedule an autoresponder and it will take care of the rest. Not just a welcome email, you can do a lot more with autoresponders. A simple reminder can show you care. Send reminders to your customers about subscription renewals, promotional offers, or any time-critical information using date-field autoresponder. You can also use this autoresponder to send them birthday and anniversary wishes. Boost your sales during the holiday season. Holiday sales can be crucial to the business' bottom line. That is when people shop more and look for discounts. Send out season’s greetings, holiday promotions, and special offers to your customers by scheduling a calendar-based autoresponder. 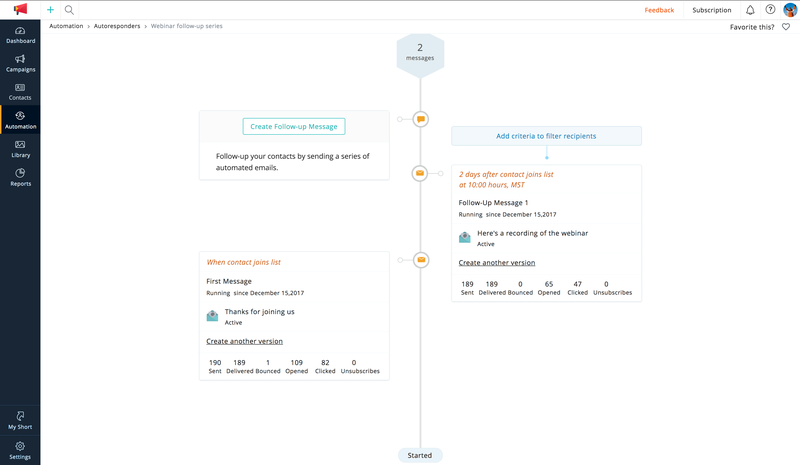 Set up workflows for enhanced targeting and personalization. Interacting with your audience regularly can build trust and brand recognition. 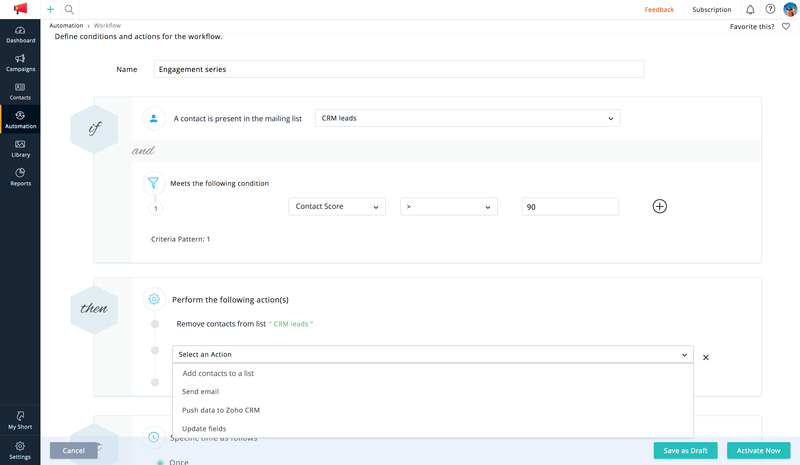 With workflows, you can segment your mailing list based on the information you have about your contacts and engage them by sending content that is pertinent to them. Nurture and engage your leads and customers. You might want to cater to different sets of people at various stages of your sales cycle. Plan a lead nurturing campaign or a customer engagement program with workflows to communicate and create a good rapport with your leads and customers. Share your expertise. Build lasting customer relationships. Set up workflows to distribute industry-related content that you produce. Be it a webinar, blog, vblog, ebook, or tutorial; send them to your contacts based on their preferences.